A Bohol tabloid publisher has been convicted of libel for a news item maliciously insinuating that a top provincial official has links to illegal drug trade. 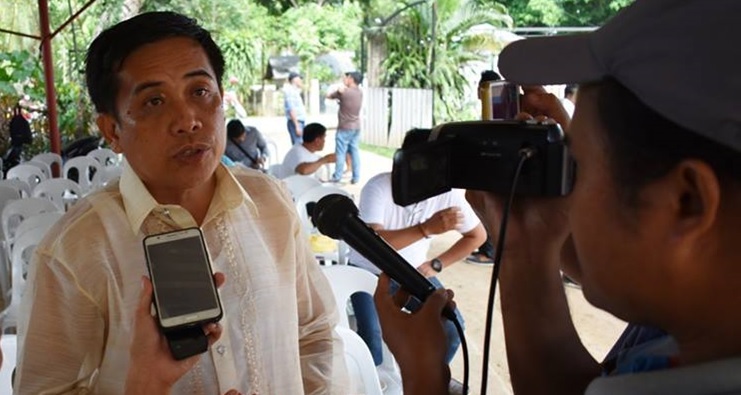 The court found Johnny Orioque, publisher of Bisayan tabloid Bohol Balita Daily News (BBDN), guilty beyond reasonable doubt for maligning Provincial Administrator Alfonso Damalerio II. Presiding Judge Suceso Arcamo of the Regional Trial Court (RTC), Branch 47 in Tagbilaran City promulgated the conviction in his order read to the defendant on Friday, June 29. The court fined Orioque P30,000 with subsidiary imprisonment in case of insolvency and ordered him to pay complainant Damalerio P500,000 in moral damages. But still, “media people do not have the unbridled license to malign his honor and dignity by indiscriminately publishing malicious comments and reports about his personal life,” the court ruled. The case stemmed from an article, entitled “Ae Damalerio nangulipas sa paglambigit sa police kaniya sa illegal drugs (Ae Damalerio denies police allegation linking him to illegal drugs),” published in the BBDN on October 9, 2014. The item was also about the arrest of a drug suspect, Tyrone Animas, and capture dead of another suspect during a police operation in Tagbilaran City which hot pursuit reached up to the Bohol Tropics. “The police are dismayed and doubtful on the presence of Damalerio in the said resort which is being owned by the family of the city mayor,” the news item continues. Neither was Damalerio’s name ever mentioned on matters pertaining to involvement in illegal drug, the former city police chief said. Olaivar was a former provincial head of the SWAT and Provincial Public Safety Company of the PNP and he had to conduct special reinforcement, raids, investigation and intelligence work against big-time drug elements. Instead, Olaivar said, Damalerio has been supportive of the PNP’s crackdown on illegal drugs, especially that he is tasked by the governor to help sustain the police anti-drug operations. Damalerio, until the present, is also the chairman of the Local Finance Committee and cluster coordinator for peace and order and public safety of the provincial government. Damalerio said the article was malicious because he had never been interviewed by the BBDN about the issue of his presence at Bohol Tropics during the legitimate police operation against the drug suspects. He did not even personally know the drug suspect (Animas). During the operation, then PNP Provincial Director Dennis Agustin kept updating Damalerio of the situation. Damalerio even had to advise the Bohol police chief to exercise extreme caution and avoid any exchange of gunfire considering the guests, workers and other civilians at the resort and its vicinity. By mobile phone, the police official informed the provincial administrator that a shootout did happen and two of the suspects were wounded. Agustin asked Damalerio for an ambulance and the latter thus sped to the area together with some TaRSIER 117 emergency response workers. Unfortunately, one of the two wounded suspects died. According to Damalerio, the tabloid of Orioque maliciously mentioned his name without asking his side and even insinuated that he meddled in the police operation and tried to prevent the arrest of Animas. Damalerio recalled that he and his TaRSIER 117 rescue workers sped to Alburquerque to respond to a vehicular accident two years before their Bohol Tropics emergency mission. But before they could even reach the town, they were informed that the victims were already transported to the hospital by a vehicle bound for the city. One of the victims was Orioque himself. Damalerio observed that even before, Orioque had always been critical to the provincial administration and not fair in reporting. Prior to the BBDN publication, Damalerio already explained his side and clarified the issue to several members of the local media. The text message was allegedly read by a policeman on air. Obedencio then submitted his article to the BBDN, “forgetting” to put his name as the reporter. Orioque said he was never driven by malice and bad intention in publishing the article since he and Damalerio had no misunderstanding. The publisher even thought of the article as a “big help” to Damalerio as he was able to deny the allegation. Based on his testimony, the court said Orioque did not verify from Damalerio himself as “it is not their practice of calling public officials concerning certain issues before publishing” them. “Certainly, the statements that the police are dismayed and doubtful on the presence of Damalerio at Bohol Tropics and that Damalerio alleged that he does not know the identities of the wife and brother of Animas…are unnecessary, immaterial and clear insinuations on the part of the accused that, indeed, the private complainant is involved in illegal drug either as coddler or protector,” the court said. On the element of malice, Orioque claimed there was none since the article was just a fair and honest report of the denial of the complainant. The reporter, although failing to include his name in the article when he submitted it, merely relied on secondary sources instead of personally interviewing the complainant, according to the court. “It is expected that any negative report linking the present provincial administration and its officials, like the herein complainant, such as involvement in illegal drug, is an apple of the eye and a welcome development to the accused as publisher/editor-in-chief,” The court said. “If the utterances are false, malicious or unrelated to a public officer’s performance of his duties or irrelevant to matters of public interest involving public figures, the same may give rise to criminal and civil liability,” the decision said, also quoting a high court ruling. Orioque is himself also now a public official, he having been elected barangay captain of Poblacion in Trinidad, where his tabloid business is based. Damalerio was assisted by lawyer Lord Marapao IV while Orioque had lawyer Danilo Bantugan as his counsel.